Mrs. Maryam Rajavi, the president of the National Council of Resistance of Iran (NCRI), attended a gathering of members of the People’s Mojahedin Organization of Iran (PMOI/MEK) in Albania to celebrate the Iranian New Year, Nowruz, on March 20. The event featured speeches by political supporters of the Iranian Resistance from throughout the world and the members of NCRI. “Congratulations on the advent of the New Year 1398, to my compatriots in all cities and villages of Iran and to Iranians the world over. Nowruz congratulations to the families of martyrs, to the resistance units, to supporters of the Iranian Resistance, to political prisoners, to NCRI members, to PMOI freedom fighters and to Massoud Rajavi, the leader of the Iranian Resistance. Congratulations on 1398, the year of uprisings, the year of hope and excitement, and the year of advancing and lunging forward to achieve freedom. Happy New Year to the people of Iran who never lost hope even under the oppressive rule of the vicious mullahs. 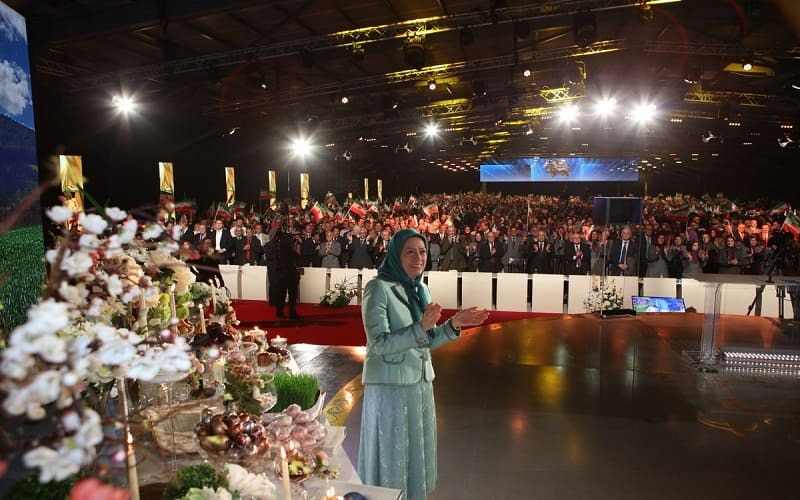 In Nowruz celebration, Mrs. Maryam Rajavi expressed solidarity with people from all different walks of life who have upraised for their rights in Iran and said, “In the final moments before the turn of the year, we are standing with Iran’s workers whose table spreads are empty. We are standing beside the farmers whose farms are dry and dehydrated. We are standing with the honorable teachers of Iran who are discriminated against and humiliated, who have been doomed to live under the poverty line, and who are imprisoned for their legitimate protests. Mrs. Maryam Rajavi at Nowruz celebration added, “1397 was the year of the expansion of resistance units when the strategy of 1,000 Ashrafs and the army of freedom shined brighter than ever in our occupied homeland. 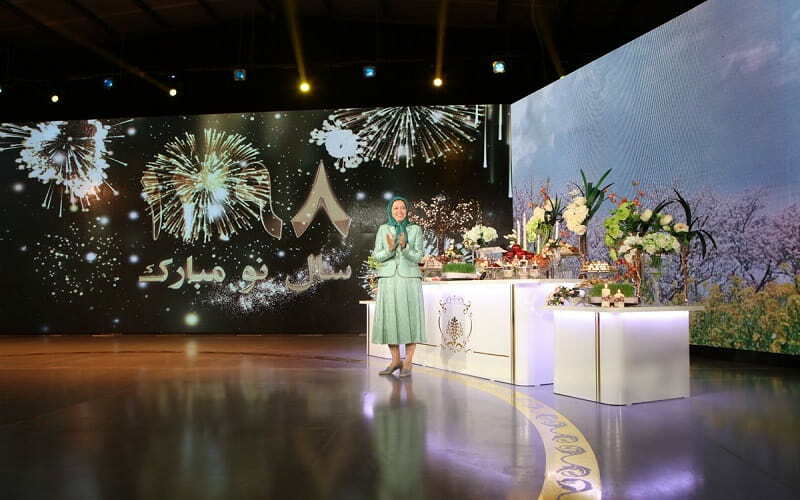 Mrs. Maryam Rajavi in Nowruz celebration, pointed to the nationwide protests and uprisings in Iran, “In the past year, Iran grew many blossoms heralding its political and social spring. The blossoms of uprisings, protests, and strikes. The uprisings in the cities of Kazerun, Borazjan, Ahvaz, and Khorramshahr. The uprising of Tehran’s Bazaar. The uprisings in early August in 27 cities. In Nowruz celebration speech, Mrs, Maryam Rajavi stipulated the end of the illusion of a potential moderated regime, “Moderation was put to death by the appointment of Ebrahim Raisi as Chief Justice. He is a hated mass murderer who ran against Rouhani in the regime’s presidential elections. Raisi’s appointment was a coup de grace to the illusive myth of moderation. This happens while Rouhani’s government is half-paralyzed as their showcase foreign minister keeps sitting at home every other day or resigns. The problem is not whether this regime is engulfed in this or that crisis; the problem is that the mullahs’ rule is in crisis all together. Yes, the crisis is the crisis of overthrow. Throughout the past year, they were dreaming of finding a way out by annihilating the Mojahedin and the Iranian Resistance. Therefore, they concentrated the core of their efforts on terrorism and demonization, which targeted the Mojahedin, but they failed. Last year, the National Liberation Army culminated in 1,000 Ashrafs and resistance units, which sprouted in cities across the country. Now, the strategy and stances of the Iranian Resistance are echoed by the words and demands of workers, truckers, teachers, students, farmers and all protesters throughout the country: The overthrow of the clerical regime is the desire and demand of all the people of Iran. In the beginning of the New Year, I want to tell all mothers and fathers, my sisters and brothers, my young daughters and sons, that in the face of the criminal mullahs, you must move hand in hand to welcome the New Year 1398, the year of uprisings, upheavals and revolution.